Described by the Alpine Journal editor Edward Strutt as “the most imbecile variant since mountaineering first began”, the north face of the Eiger has drawn climbers to its flanks for over three quarters of a century. Viewed from Kleine Scheidegg, the distinctive triangular face looks almost symmetrical as it rises majestically above the bustling tourist town of Grindelwald whilst the striking rock walls and snowfields, contrast starkly with the rolling green meadows and farmland of the surrounding area. My first glimpse of the face was in 2004 whilst on a walking holiday with my parents. The imposing cliffs of the north wall only made a short appearance from the thick cover of mist and cloud that so often cling to it, but this was enough to inspire an interest in the face that led me to read Heinrich Harrer’s ‘The White Spider’. The tales in this book, of the attempts to make the first ascent of the ‘nordwand’, made for chilling yet compelling reading. Although heroic in my eyes, perhaps there was some truth in Strutt’s description that here was “an obsession for the mentally deranged”. Many young and talented climbers lost their lives on that face, in fact, since 1935 over sixty climbers have died on the Nordwand. Sections of the cliff became synonymous for their danger, even gaining names following notable successes or deaths. 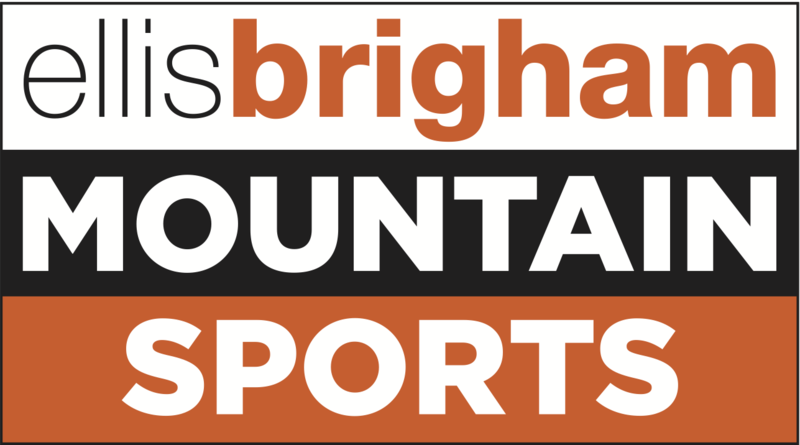 Behind each name lies a gripping story in its own right, such as Mehringer and Sedlmeyer’s ill-fated 1935 attempt which ended at the grimly named Death Bivouac. Or Hinterstoisser’s famous tension traverse which remains one of the most technical sections of the 1938 route to this day when ropes aren’t fixed in place. 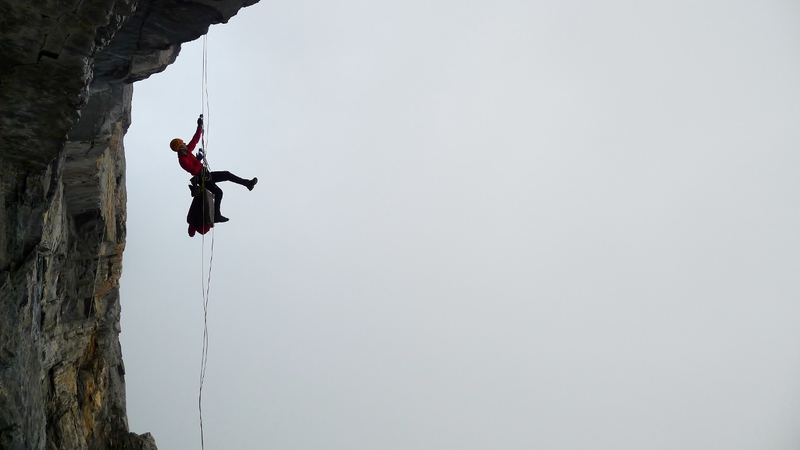 Some of my favourite ‘Eiger’ stories were of the early British attempts and ascents. Don Whillans, on his only attempt on the face, decided that the rockfall danger was too great and bluntly told two excitable Japanese alpinists who seemed unfazed by the risks that they might be going ‘up’ a lot faster than they expected! Eric Jones’ modest early solo ascent of the face also stood out to me as a wild ride and became all the more prominent as I regularly visited his cafe beneath the Welsh cliffs of Tremadog. The photos in the cafe of this quiet, unassuming pensioner climbing and base jumping around the world were inspirational to me as a youngster. Eight years on from that first glimpse of the Eiger I found myself looking yet again at its alluring face in the middle of March. Clear of cloud, I could distinguish the features I had read so much about and under its wintery coat they became all the more prominent. Andy and I walked through deep snow from Kleine Scheidegg to bivi at the base of the wall ready for an early start the following morning. My dreams were vivid that night as I anticipated the coming day’s climbing; in one, I imagined I was slowly being buried alive by snow. I awoke, after a cold night, to a rather muffled world inside my bivi bag. Snow surrounded me on all sides and after wriggling free I realised that my vivid dreams were probably due to my hypoxic state zipped up inside my bivi bag. 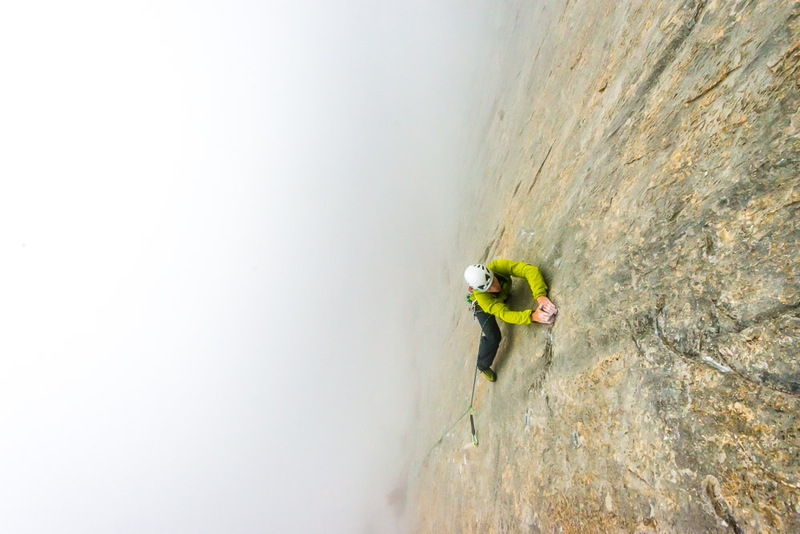 An unforecasted storm had dumped around a metre of snow and my Eiger dreams were put on hold. Five months later and I was back in Grindelwald, this time with Dave Macleod with thoughts of attempting a very different line to that of Heckmair and co’s ‘38 route. In 2003 Ueli Steck and Stephan Siegrist opened a new line up the overhanging Rote Fluh and Czech Pillar which they christened ‘Paciencia’. 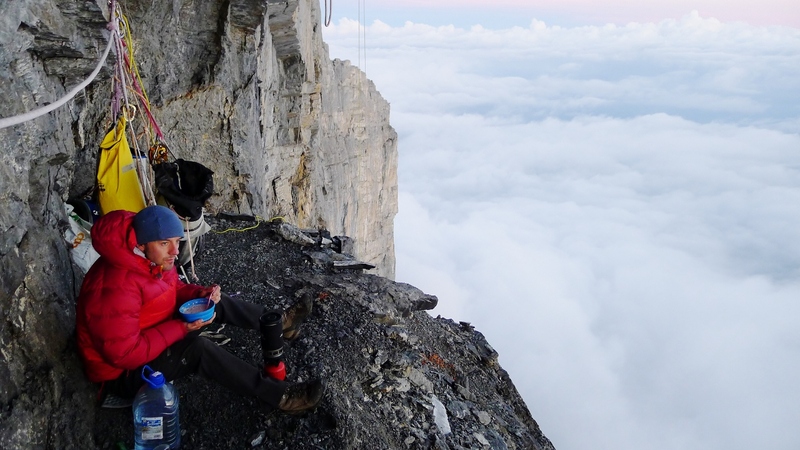 The climb indeed thoroughly earned its title as it wasn’t until 2008 that Steck made the first free ascent, having waited for the unlikely combination of a strong partner, good weather and suitable conditions to complete the line. Although the route is mainly reliant on bolts for protection it shouldn’t be considered as simply a sport route. On most pitches below 7b in difficulty there are considerable run-outs and on the upper section of the Czech Pillar the rock deteriorates into poorly stacked Jenga requiring a cool disposition to climb on. 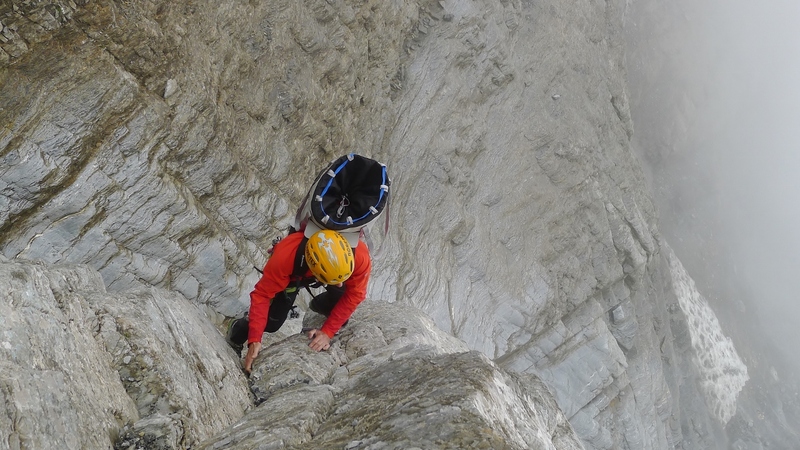 That said, the quality of limestone on the harder pitches is immaculate and if you’re able to free climb your way through the Rote Fluh you shouldn’t have any problems with the more psychologically testing pitches high up on the route. I first became aware of Paciencia in 2011 having heard of David Lama’s very impressive two day ascent. 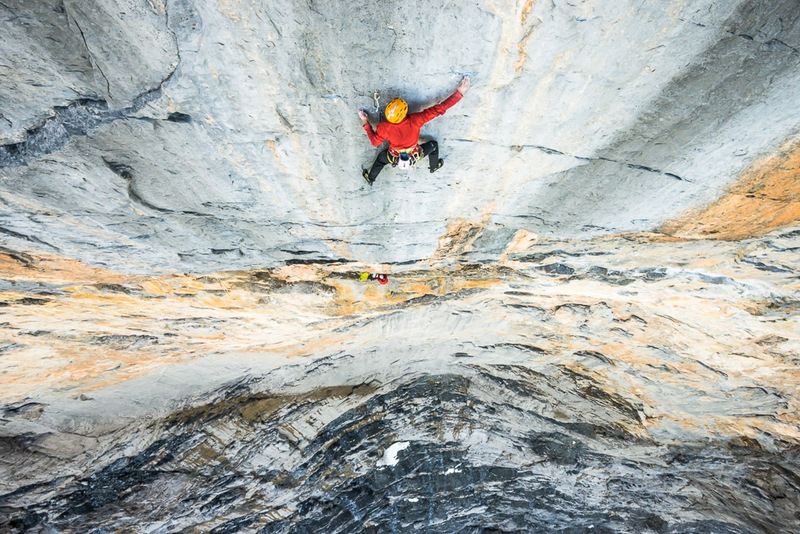 In an article written on-line, he described Paciencia as “by far the most difficult rock route I have climbed to this date in the Alps”, quite some statement considering his previous alpine achievements and worrying to any climbers with prospects on the wall. Nevertheless, it sounded like an adventure worth seeking out and a free ascent could just about be within the realms of possibility for me. 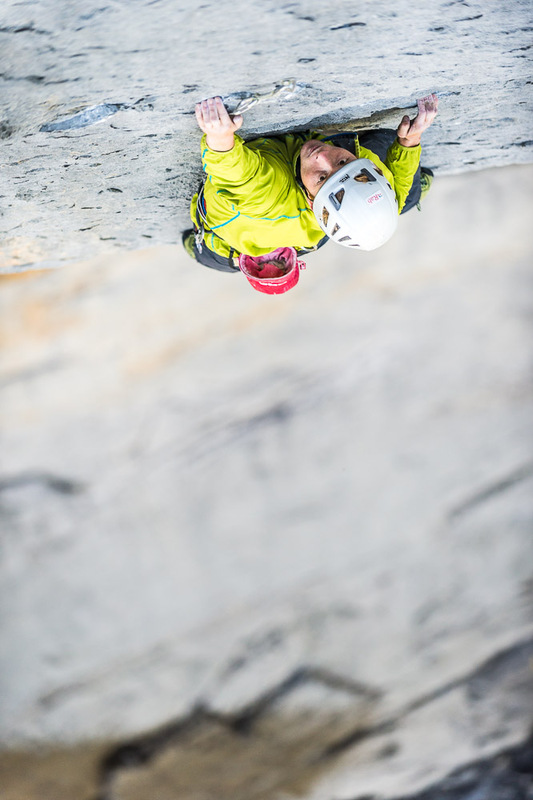 This was to be the first time Dave and I had climbed together and when we met in Chamonix at the beginning of August it quickly became apparent that from our shortlist of routes, Paciencia was the one at the forefront of both of our minds. Dave had never climbed in the Alps before, but I reasoned that as one of the best all-round climbers in the world he shouldn’t have too much trouble walking on a glacier! We seemed to get on well immediately as we discussed tactics for the route. Dave’s a thoughtful guy and one of the most motivated people I’ve ever climbed with; not only did I feel like I could trust him immediately but he’s also someone I could have a laugh with which is always nice when you’re alone together on a multi-day route. We arrived in Grindelwald to the aftermath of three days of storms which left waterfalls running down the face as well as huge wet streaks down the Rote Fluh. Procrastinating in the valley was not what we were there for, but having read various accounts of climbers’ experiences on this wall, it sounded like this was just part and parcel of the Eiger adventure. Two days later and with a promising forecast we prepared for a quick recce of the first pitches of Paciencia as the wall was still wet in places. We caught the Jungfraujoch from Grindelwald in late morning hoping to get dropped off at the Stollenloch – the window from which it is possible to access the north face directly. Unfortunately we were told that we’d need special permission to get dropped off there but not to worry because “Ueli Steck needs 15 minutes only” to reach the Stollenloch. We refrained from saying that it took him a further seven and a half years to get from the Stollenloch to the top of the Czech pillar! The scramble up to the Stollenloch is quite time consuming on first acquaintance, especially in the cloud that descended upon us whilst we were halfway up it. Scree, snow and loose wet rock bands weren’t particularly fun in approach shoes whilst carrying heavy bags; in fact, they were actually quite dangerous. We had to descend this scramble all the way back to the base of the nordwand to pick up the rest of our kit before heading back up to the bivi spot next to the Stollenloch. It’s a surreal experience waking up on such an intimidating north face to the sound of a door opening and two climbers walking out of a train full of Japanese tourists. 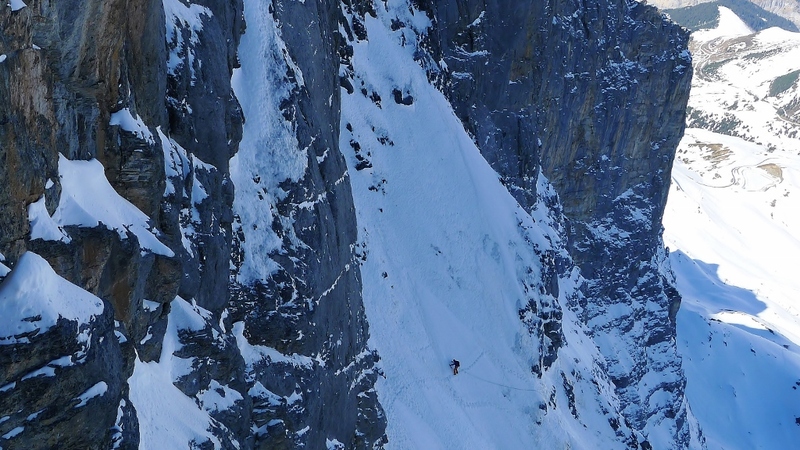 Robert Jasper and Roger Schaeli both had ambitions of their own on the face; an impressive new route crossing Paciencia at the large roof of the Rote Fluh. They pointed out the way to our bleary eyed selves and were off up their fixed lines before we’d even had breakfast; I’ve never been very good at alpine starts! When we finally dragged ourselves out of our bivi bags feeling damp and cold we made our way up to the first tricky pitch. Originally graded at 7b by Steck it was pronounced a sandbag by Lama who upgraded the pitch to 7c. Keen to make a good start to the route I fought my way upwards to flash the pitch by the skin of my teeth and Dave led through up the following pitch with cold hands – something we were to get used to on the following days. The climbing itself was fantastic wall climbing with sustained moves on small but positive crimps and pockets, reminiscent in many ways to Ceuse or the Verdon Gorge. Although we were both happy with our progress and the feasibility of the lower section of the route, we were concerned about how tired our arms felt after comparatively so little climbing, especially considering the crux pitches were higher up the route. Once back at the Stollenloch, we managed to hitch a lift on the train down to Kleine Scheidegg. All you need to do to stop the train is flash your headtorch up the tunnel and the driver will happily stop and let you jump on board! We were joined by Roger and Robert and it was interesting talking to them as they know the face like the back of their hands, having climbed many of the routes as well as opening up some new lines of their own. Their current project will no doubt be an amazing route when finally completed and perhaps be the next step up in difficulty on the face. When we arrived at Kleine Scheidegg, I decided to hop off the train in order to save both money and my return ticket for when we were descending from the top of the route. This was somewhat naive of me as the descent to Grindelwald was significantly further than anticipated and running in my approach shoes and softshell trousers on a hot summer’s evening, not only left me hot and bothered, but also aching for the following few days! After a couple of rest days the wall seemed to be dry in its entirety. We were joined, for the first day of the route, by the talented alpine photographer Alexander Buisse who was keen to make the most of the opportunity to get photos of such a spectacular wall. We were mainly unburdened scrambling up the lower part of the face this time, having stashed most of our kit at the stollenloch and the scramble upwards nearly passed a lot more pleasantly. Unfortunately for Alex though on one of the steeper sections of scramble a hold broke off and he described seeing his life flash before his eyes in the time it took his reflexes to regain stability on the rock. Despite having recovered balance Alex was understandably cragfast. I climbed back down to him and cautiously plucked the bag off his back which contained the only rope between the three of us. I quickly passed an end to Dave to try and find a belay before belaying Alex onto easier ground. This experience reminded us of just how dangerous this wall can be; especially considering that at our relatively comfortable bivi spot outside the Stollenloch, we were little more than a stones’ throw away from where Toni Kurz met his untimely demise. We climbed the first four difficult pitches up to the crux in deep cloud that evening in order for us to spend as much time as we needed the following day on the 8a. The climbing went quickly and relatively easily filling us with confidence for what lay ahead. We awoke to blue skies and fresh arms the next morning and after hauling our bags up the fixed lines, were back at our highpoint. The crux pitch of Paciencia is really spectacular. It breaches a roof 200m above the approach slopes before continuing up a gently overhanging wall. Although never desperate, the climbing is extremely sustained requiring good endurance and a steady pace so as not to blow any moves. We both managed to red-point it on our first attempt, though not without a bit of a fight, and had a perfect view of the base jumpers and wingsuiters leaping from the giant mushroom feature now nearly level with us on the right side of the face. Jubilant after having climbed such a great pitch we made steady progress up the easier but still difficult and time consuming upper section of the Rote Fluh and finally reached our second bivi point beneath the Czech Pillar. Satisfied and tired after our days work the ledge seemed a comfortable place to hang out as well as being protected from rockfall by a large roof. In the evenings we ought to have been basking in sunshine on the face but every day without fail the clouds would roll in and instead of warming up, we’d be sat shivering with a cup of tea. When the sun set, the face would quickly clear of cloud and over the four days we spent on the wall we received about thirty seconds of sunlight! We awoke on the second morning to a spectacular cloud inversion but slightly cooler temperatures. The tinkle of cow bells could still be heard clearly below as we prepared ourselves for another days climbing. Both Dave and I were beginning to feel pretty tired from the previous days too and although we succeeded quickly on a bouldery pitch of 7c we felt utterly wasted on the next pitch, a long and technical 7c+. It ought to have been my lead but with nearly no gas left in the tank I handed the reins over to Dave who kept it together on lead despite a hold breaking near the top of the pitch. I just about managed to free the pitch on second and after a couple more challenging pitches, climbed with extremely cold hands, we fixed the ropes down to the bivi ledge to spend what we hoped would be our last night on the face. After our day’s climbing we both felt exhausted and were not at all looking forward to the next day which would involve one more difficult pitch on top of a number of moderately tricky ones. It must have been worse for Dave who found that his dehydrated meal tasted of burnt rubber commenting that “it really must be bad if two cold and hungry men on the north face of the Eiger can’t eat it!” That night we were woken by the ‘whooshing’ sound of a large rockfall that came from directly above our heads. Fortunately the big roof we were beneath protected us entirely but the experience didn’t make for a great night’s sleep. The next morning we arose early to cool conditions ready for the final push. Surprisingly, we both felt a lot better than the previous day and made swift progress up the final difficult pitch. From here the pitch lengths were very long and the ground a bit more broken making hauling difficult. This was slightly heartbreaking as hauling can be a very tiring thing, especially when bags need to be re-lowered to free them. The rock quality also deteriorated at this point and the ground simply couldn’t be rushed. The final pitch was wildly under-graded with steep climbing on poor quality rock. A glimmer of sunlight on the ridgeline spurred us upwards and it wasn’t long before we were basking in the warm evening sunlight as we stripped down to t-shirts for the first time in four days. Although I always enjoy climbing these big routes I always feel a sense of relief to get off the wall as the final day tends to feel like an ordeal battling upwards with tired bodies and never enough food or water. We descended the scree slopes of the west flank of the Eiger rapidly, keen to make it down to the valley before it got too late. Ironically, my carefully saved return ticket from Kleine Scheidegg ended up being wasted as we missed the final train back down and the long stomp down to Grindelwald at night time with the heavy haul bag and ropes was an unpleasant end to a great days climbing and it was nearly midnight by the time we reached the car. It seems strange to me now that this face is only really known for its original 1938 route. To me, the north face of the Eiger is a very modern rock face. From its first ascent three quarters of a century ago, climbing standards have continued to be pushed on this face more than in any other alpine area. From the staggering speed ascents of Dani Arnold and Ueli Steck to the cutting edge alpine mixed routes such as the ‘Young Spider’ the face remains to be a testing ground for the modern alpinist, just as it was for Heckmair and his team in 1938. There are still new routes to be climbed and unrepeated challenges to savour, if you have the patience.